Camille has always enjoyed an abundance of freedom for a young lady in the late 19th century. She has traveled far and wide with her father on his merchant ship, and prefers her life of adventure and ease to the stuffy society life of her peers. But her upcoming journey to Australia is quite unlike the others: it shall be her last before her marriage to the wealthy Randall Jackson, who expects her to embrace propriety and cease sailing with her father. But before they can reach their destination, Camille uncovers a long kept secret of her father's and the unpleasant truth about her future…and their ship is wrecked in a terrible storm. Camille and her father's handsome first mate, Oscar, are two of the only survivors, and Camille must convince Oscar to help her find her mother, a woman Camille thought was dead, and discover an unbelievable artifact her mother has kept hidden from Camille's father--and his enemy, who is still very much alive. 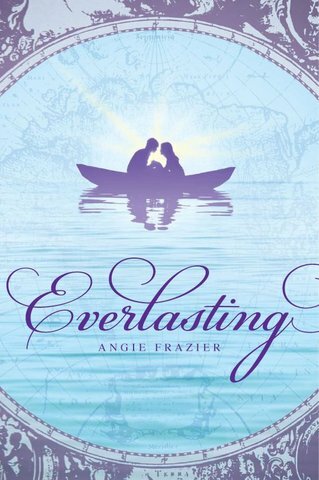 Angie Frazier has a strong and talented voice, as revealed in this debut novel. Everlasting is adventurous, smart, and sweet, and contains many unique elements that will cause this novel to stand out. The characters are realistic and personable; Camille is a strong and capable character who possesses courage and determination to get her through the toughest of situations. Oscar is witty, sharp, and loyal, and his past in an interesting one. Even the supporting characters, like Oscar and Camille's Australian guide, Ira, are well rounded, and add a spark of humor and fun to the story. The plot is well drawn out, with just enough mystery to keep you reading, and excellent, descriptive settings. Frazier's research is evident in the descriptions and setting, though more details and information concerning Australia during the time period would have been welcome. Nonetheless, the pacing is perfect and the romance is sweet and exhilarating. Camille's mix of emotions—grief, love, guilt—is portrayed very well in all that Camille does and learns, and in the choices she makes. There are some light supernatural elements present in the book, but they aren't overbearing, so the book does seem to be more of an adventurous historical fiction novel than just another paranormal romance, a welcome distinction. Everlasting is a unique and enchanting novel about love, grief, and above all, forgiveness, that will have you wondering at the outcome until the sweet and satisfactory ending. Angie Frazier is most definitely an author to watch. Cover Comments: This cover is beautiful! It's romantic, and the boat and water are so fitting. I am loving the blue and purple color combination. It was this lovely cover that first grabbed my attention, so it has definitely done its job well! 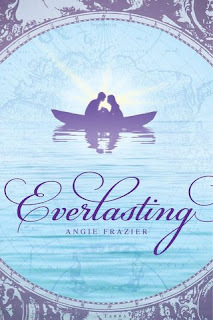 Everlasting will be available on June 1st, 2010! While this book does look interesting and like something I might want to read, I can't get over the cover. I mean, is it just me or is it not a wide view from The Little Mermaid when Ariel and Eric are in the rowboat? At least, that's what it reaminds me of and was the first thing that came to mind when I saw it. Great review! I can not wait to read this!! I agree with -k on the cover. But I did like the book. I love the cover of this book as well! It definitely caught my attention. I do admit that it reminded me a bit of a Disney-type thing, but to me, that's a good thing. Can't wait to read it! I'm really looking forward to this one (love boats), and so I'm really glad to hear you enjoyed it! While this book seems interesting, I can't get over the leading guy's name. Oscar?! What kind of a name is Oscar. Can you imagine her calling out his name "Oscar". I love Oscar's character and I agree, the cover is gorgeous!